The holidays will be here before we know it, there’s no use in fighting, there’s no way to slow it! While you’re making those lists and checking them twice, don’t forget to add the classics – SANTA CLAUS IS COMIN’ TO TOWN! ® 45TH ANNIVERSARY COLLECTOR’S EDITION, FROSTY THE SNOWMAN 45TH ANNIVERSARY COLLECTOR’S EDITION and THE ORIGINAL CHRISTMAS CLASSICS ANNIVERSARY COLLECTOR’S EDITION GIFT SET on Blu–ray and DVD to be precise! GLENDALE, CA (November 9, 2015) – Do you recall when you were small…and reindeer flew, snowmen spoke, and Santa came to town? On November 3rd, kick off the holidays with the family favorites from the Original Christmas Classics Anniversary Collection featuring the Blu-ray and DVD release of SANTA CLAUS IS COMIN’ TO TOWN! 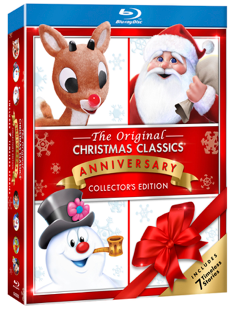 ® 45TH ANNIVERSARY COLLECTOR’S EDITION, FROSTY THE SNOWMAN 45TH ANNIVERSARY COLLECTOR’S EDITION and THE ORIGINAL CHRISTMAS CLASSICS ANNIVERSARY COLLECTOR’S EDITION GIFT SET featuring all-new bonus material, including singing, fun facts, crafts and more! Learn to Draw - Sketch classic characters Rudolph, Hermey and Bumble. Share the wonder and the joy of these seven timeless stories with your children and grandchildren…creating new memories and holiday traditions that you will cherish through the years. Plus Frosty Returns, Mr. Magoo's Christmas Carol, Little Drummer Boy, and Cricket on the Hearth!